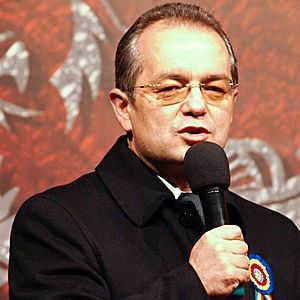 Emil Boc (b. 6 September 1966, Răchițele, Cluj) is a Romanian politician. He was the president of the Democratic Liberal Party from 2005 to 2012. He was Prime Minister of Romania from 2008 - February 2012. Now he is Mayor of Cluj-Napoca. He finished The University of History and Philosophy Cluj and Law School. Emil Boc Facts for Kids. Kiddle Encyclopedia.